The original county structure has its origins in the Middle Ages. These counties are often referred to as historic or traditional counties. The Local Government Act 1888 created new areas for organising local government that it called administrative counties and county boroughs. These administrative areas adopted the names of, and closely resembled the areas of, the traditional counties. Later legislative changes to the new local government structure led to greater distinction between the traditional and the administrative counties. 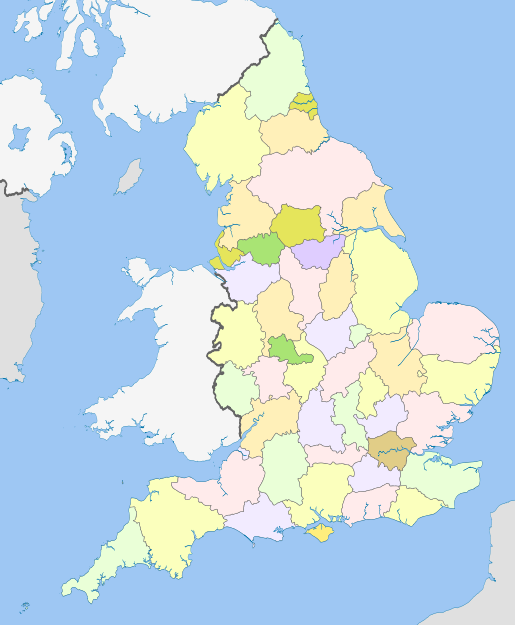 Buckinghamshire, Cambridgeshire, Derbyshire, Devon, East Sussex, Essex, Gloucestershire, Hampshire, Kent, Lancashire, Leicestershire, Lincolnshire, North Yorkshire, Nottinghamshire, Somerset and Staffordshire are non-metropolitan counties with multiple districts and a county council, where one or more districts have been split off to form unitary authorities. The effect is that the corresponding ceremonial county is larger than the non-metropolitan county of the same name and the county council is responsible for providing services in only part of the county. In Cornwall, Dorset, Durham, East Riding of Yorkshire, Shropshire and Wiltshire the bulk of the area is a unitary authority which shares the name of the ceremonial county and the rest of county is part of one or more other unitary authorities. In total, there are 39 unitary authorities that do not share the names of any of the ceremonial counties. Bedfordshire and Cheshire are counties that consist of a number of unitary authorities, none of which has the same name as the ceremonial county. The City of London and Greater London are anomalous as ceremonial counties that do not correspond to any metropolitan or non-metropolitan counties, and pre-date their creation. Most English counties were established in the Middle Ages sometime between the 7th and 11th centuries. The early divisions form most of the current counties, albeit with adapted boundaries. Counties were used for the administration of justice, the organisation of the military, local government and parliamentary representation. Some larger counties were divided early on for many purposes, including Yorkshire (into Ridings), Lincolnshire (into Parts) and Sussex (into East and West). In 1832, the Great Reform Act divided larger counties for parliamentary purposes. Changes in the administration of the Poor Law in 1832 and later the implementation of sanitary authorities caused the use of traditional divisions for civil administration to wane. The like-named and broadly similarly shaped registration counties existed for these purposes from 1851 and were used for census reporting from 1851 to 1911. Their boundaries differed from existing counties as they were formed from the combined areas of smaller registration districts, which crossed historic county boundaries. By the late nineteenth century, there was increasing pressure to reform the structure of English counties. A boundary commission was appointed in 1887 to review all English and Welsh counties, and a Local Government Bill was introduced to parliament in the following year. The resulting Local Government Act 1888 divided the counties into administrative counties, controlled by county councils and independent areas known as county boroughs. On 1 April 1974, the Local Government Act 1972 came into force. This abolished the existing local government structure of administrative counties and county boroughs in England and Wales outside Greater London, replacing it with a new entirely 'two-tier' system. It created a new set of 45 counties, six of which were metropolitan and 39 of which were non-metropolitan. The historic county boundaries were retained wherever it was practicable. However, some of the counties established by the Act were entirely new, such as Avon, Cleveland, Cumbria, Hereford and Worcester, and Humberside, along with the new metropolitan counties of Greater Manchester, Merseyside, South Yorkshire, Tyne and Wear, West Midlands and West Yorkshire; based on the major conurbations. The counties of Cumberland, Herefordshire, Rutland, Westmorland, Huntingdon & Peterborough and Worcestershire were disestablished. The abolition of the county boroughs resulted in the distinction made between the counties for Lieutenancy and those for county councils becoming unnecessary. Section 216 of the Act adopted the new counties for ceremonial and judicial purposes, replacing the previous non-administrative counties. As well as unitary authorities covering large towns, some small counties such as Rutland and Herefordshire were re-established as unitary authorities. In 2009 unitary authorities were created to replace each of the county councils of Cornwall, County Durham, Northumberland, Shropshire and Wiltshire. Bedfordshire and Cheshire were thus abolished as non-metropolitan counties but are retained as ceremonial counties, divided between their unitary authorities. There is no well established series of official symbols or flags covering all the counties. From 1889 the newly created county councils could apply to the College of Arms for coats of arms, often incorporating traditional symbols associated with the county. This practice continued as new county councils were created in 1965 and 1974. However these armorial bearings belong to the incorporated body of the county council and not to the geographic area of the counties themselves. As county councils have been abolished, and unitary authorities have been carved out, these symbols become obsolete or effectively no longer represent the whole ceremonial county. A recent series of flags, of varying levels of official adoption, have been established in many of the counties by competition or public poll. County days are a recent innovation in some areas. There are seventeen first-class county cricket teams that are based on historic English counties. They are Derbyshire, Durham, Essex, Gloucestershire, Hampshire, Kent, Lancashire, Leicestershire, Middlesex, Northamptonshire, Nottinghamshire, Somerset, Surrey, Sussex, Warwickshire, Worcestershire and Yorkshire. There are also nineteen minor county teams. They are Bedfordshire, Berkshire, Buckinghamshire, Cambridgeshire, Cheshire, Cornwall, Cumberland, Devon, Dorset, Herefordshire, Hertfordshire, Lincolnshire, Norfolk, Northumberland, Oxfordshire, Shropshire, Staffordshire, Suffolk and Wiltshire. The County Football Associations are roughly based on English counties, with exceptions such as the combinations of Berkshire and Buckinghamshire and Leicestershire and Rutland. ^ "The problem of "county confusion" – and how to resolve it". County-wise. Retrieved 28 July 2018. ^ Ministry of Housing, Communities & Local Government (1 October 2013). "England's traditional counties". HM Government. Retrieved 28 July 2018. ^ Kingdom, John (1991). Government and Politics in Britain. ^ "Police Act 1996". legislation.gov.uk. p. 1. Retrieved 30 July 2018. ^ Thomson, D. (1978). England in the Nineteenth Century (1815–1914).